Pas a Pas is an interactive educational tool that enables children to learn and experiment through animation. It is designed to support and integrate in to an existing curriculum and is not meant to alter the natural learning pace of children. Pas a Pas incorporates physicality and the animated outcome of stop motion animation to bridge the gap between abstract concepts from maths, physics or arts – usually represented by graphs, equations or words – and reality. Pas a Pas contributes to an education that integrates ‘play’ and ‘create’ in to the learning process. Due to the inherent tangibility of stop motion animation, the concept fits into Montessori education methods – it is aligned with the idea of self-directed learning, indirect teaching and multi-age grouping. Abstract concepts have mainly been taught by repetition. 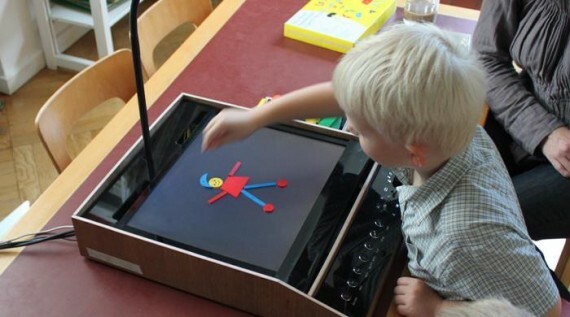 The Montessori method or newer software applications are examples of more active approaches to develop understanding. However, most of those methods don’t combine tangibility and technology – they are either analogue or computer-based. Stop motion has been used as a tool for education for two main purposes: (1) to teach children abstract concepts of time and movement, and (2) to give them the opportunity to express themselves creatively. It is easy to access the tools to perform stop motion animation. However, most software applications are designed to fulfill production workflows, rather than for education purposes. 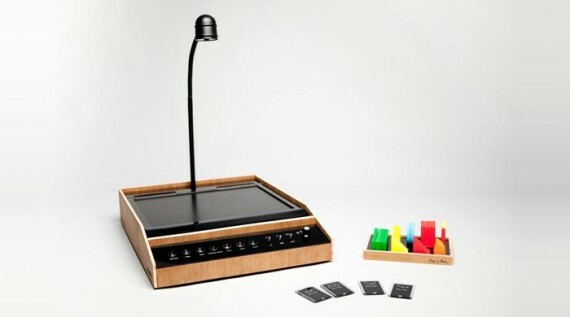 Pas a Pas is a stand-alone tool with a specific interface for children to perform stop motion animation. The system guides children through the process of learning stop motion techniques and engages them with exercises that vary in topic and difficulty, based on specific school curriculum. On the other hand, most schools are closed environments – educational material and creative content is not shared with other schools. Using Pas a Pas children can share their movies and browse other schools’ animations for inspiration. Teachers can easily design exercises and share them with other educational centers. The concept has been successfully validated with young children and teachers in kindergartens. They were able to operate the device fluently and the guiding method for animation engaged and challenged them. The exercises served to introduce them to basic concepts of geometry and demonstrated to gradually improve their notion about stop motion techniques as they were able to create more complex animations using the ‘free animation’ mode. Pas a Pas provides teachers with the opportunity to create tailored exercises, creating a complementary curriculum that allows children to explore more dynamic ways of playing and engaging with the educational content. Companies that offer school content (text books, online material, etc.) can benefit from and be inspired by a library of exercises created by teachers, and animation movies created by children from around the world. Parents have also access to their children creations, offering an insightful way of knowing about their activities at school. Other values have been detected: (1) the system fosters role taking, patience, concentration and respect for classmates. (2) It creates expectation and rewards the children with their own creation. The goal of the prototype was to validate the core of the concept – to facilitate the introduction and practice of abstract concepts. It also served to test the experience with children and educators, and to evaluate the implementation feasibility in terms of technology and cost. Since the exercises, interface and product design varies substantially depending on the target age groups, the content focuses on children aged 4-6, and the interface was designed to try out different features and test the children’s ability to use them. The product design was kept as neutral as possible. Special attention was put on finding the right buttons and toggles to achieve great tangible haptic, as well as sound feedback. To test the prototype, eight exercises were created to practice geometry for children ranging 4 to 6 years old with the support of a mathematics teacher. The device allows individual or collaborative operation. During the user testing in a Montessori kindergarten, children were taking turns to perform the exercises and they worked collaboratively while creating their own animation. In another school with 6-8 year old children, they worked collaboratively to create the animations, working around the device from all angles, each being responsible of one piece and one child using the interface.